The Nebraska TBF would like to extend congratulations to Kent Priel for winning the 2018 District 8 National Semi-final tournament and also to Chris Swift for qualifying as the Nebraska non-boater at Lake Sakakawea in North Dakota. Both anglers will move on to the TBF Nationals in 2019 to a lake that will be announced later this year. According to Kent he had about the worst practice period as you can imagine with only getting just a couple of hours in on the first day of practice before his outboard breaking down. Kent spent the majority of day 1 practice driving to a boat dealer very near Canada to get it looked at. After finding an issue he again was ready to try on day 2 but it was no better. Another dealer isolated the problem to a bad injector which was sent by overnight freight so that it would be ready for the tournaments’ first day on Saturday. Saturday was cancelled due to high winds forecasted so it all came down to one day for the tournament. 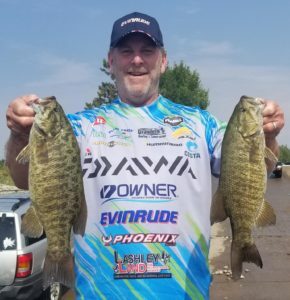 Kent took a leap of faith and went to an area that a couple of friends from western Nebraska told him about where they had caught some smallmouth bass while fishing for walleye a couple of weeks earlier. Kent ran over 40 miles to get there to find the fish ready to eat. He developed a strong pattern using largemouth methods of flipping trees with a tube using 20lb line. It did not take long to get his limit and then started heading back since the wind was getting stronger. 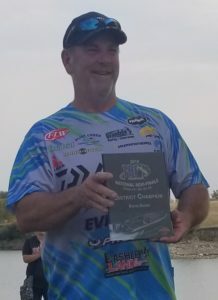 It took an hour and a quarter to travel back to weigh-in but got back safe and sound to win the boater side of the tournament.